Order Geordie Scottish Export Kit from the Stirling Homebrew Shop UK. 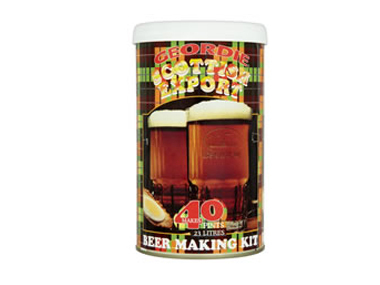 Buy Geordie Scottish Export Beer Kit - Makes 40 pints and other Beer Kits & Cider Kits safely online in the UK. Make your own beer at home! This beer kit makes 40 pints (23 litres) of Scottish Export beer. Includes instructions and the necessary chemicals. Only add sugar and water. Geordie beer kits are a fun and economic way of making your own beer at home. All kits include instructions and the chemicals needed. You need sugar, or brewing sugar, or spray malt or a combination and water to make beer from this kit. Our UK Homebrew Shop sells real Geordie and other Beer Kits & Cider Kits safely online to customers throughout the United Kingdom in England, Wales, Scotland and Northern-Ireland. View more products on the Stirling Homebrew Shop from Geordie. Where to buy Geordie Scottish Export Kit safely online? Shop at the Stirling Homebrew Shop if you are wondering where you can buy Geordie Scottish Export Beer Kit - Makes 40 pints safely online in the United Kingdom. Geordie Scottish Export Kit - Geordie Scottish Export Beer Kit - Makes 40 pints in Beer Kits & Cider Kits and Homebrew.